The list, in the previous post, of plants we’ve grown this year wasn’t really in any particular order; just off the top of my head as I cast my mind around the garden. Here, though, are some of the plants that we can say were a success. 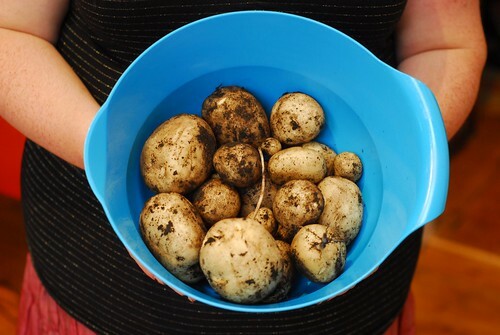 Potatoes: probably our biggest success, grown in a dustbin with holes drilled in the bottom. We grew them in a mixture of soil and compost, at first, earthing up regularly with compost until it reached the top of the bin. I was expecting flowers and fruit, which we didn’t get; and we were rather worried about a leafhopper infestation which developed, damaging the leaves quite a bit. When the foliage died back, though, we upended the bin and found a healthy crop, about 600g per seed. Next year, we hope to have room for a couple more bins. 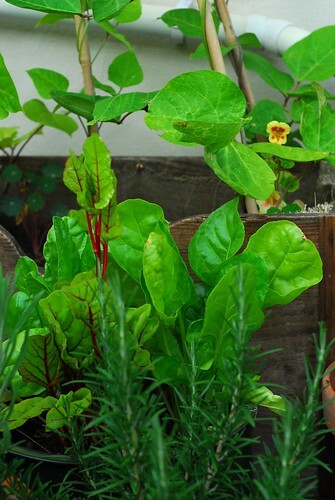 Peas: we bought small plants from the garden centre, planted them up in wine boxes, and put them on top of the garden wall, trained up the latticework. Again, each plant gave us a plentiful harvest; but we did have a bit of a mildew problem, probably caused by planting too many in each box. French marigolds: we didn’t manage to eat any, but the plants themselves have gone happily on producing flowers all summer. They’re still in flower now, with more buds on the way. Swiss chard: we planted this in a variety of containers, and tried harvesting and eating it at a variety of stages, from baby leaves to fully-grown leaves and stems. All of them worked pretty well: the baby leaves were ready fairly fast, and harvesting most of those left room for a few plants to grow into adulthood. Moreover, what we weren’t expecting was that we would be able to treat the adult plants in a cut-and-come-again fashion; we thought we’d harvested everything we could a few weeks back, but we now have healthy and harvestable leaves waiting for us again. Mint: it grew, despite the best attempts of leaf-miners and caterpillars to eat it. Moreover, we kept forgetting we had mint leaves to use, leaving the mint bush to get rather overgrown and straggly; giving it a fierce trim rather more often would have left us with a healthier plant. 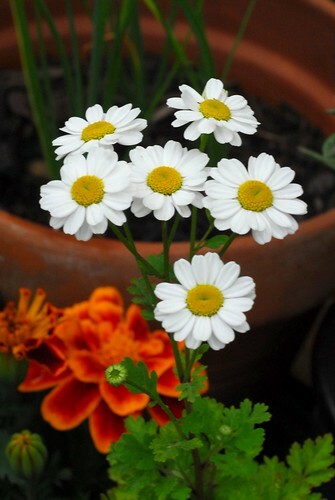 Feverfew: it grew very well, with attractive clusters of daisy-like flowers that have lasted well all summer. Now, we just have to work out what else it might be useful for.